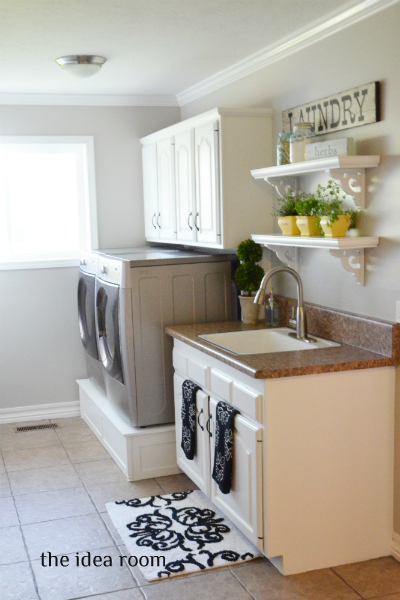 I recently shared with you our newly updated Laundry room. And I am loving it. Still a few things to get finished in there like a window treatment and some fun basket labels and such. One of the updates we made was to make our existing baseboards taller. Today I am going to share with you how to make baseboards that are short taller with an easy trick. The baseboards in our laundry room were in fairly good shape still…considering…and we didn’t want to take the time to pull them out and add new ones with all the other projects we had on our to do list! So we just updated them by adding a small thin piece of decorative molding to the top. This update is a really easy and inexpensive way to get the nicer look of the taller baseboards that don’t come in the standard house. We simply took a piece of wood that measured 1 inch and used that as our spacer to get the molding to the height we wanted. We measured and cut each piece of molding to the proper length with 45 degree angles at the corners. Then attached them to the wall with a nail gun in several spots. We do not like to use Liquid Nails at our house as we never know when we I are/am going to get a bee in my bonnet to change something around. Nail holes are much easier to repair than a wall full of Liquid Nail glue! When the molding is attached, you will then need to go and fill the cracks and crevices with white painters caulk. 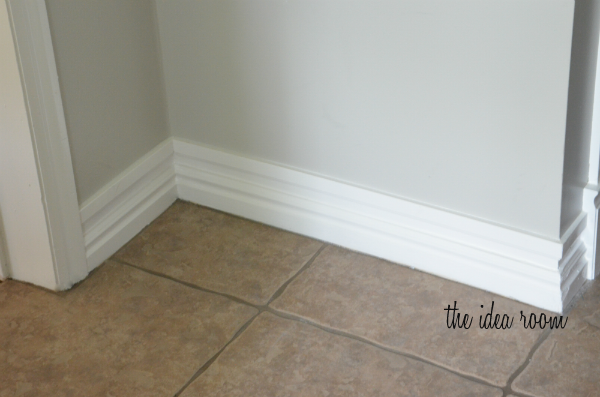 So easy, but a really important step to the overall finished look of your baseboards. When it has properly dried you can paint your baseboards. We painted ours with two coats to give it a super nice finish! 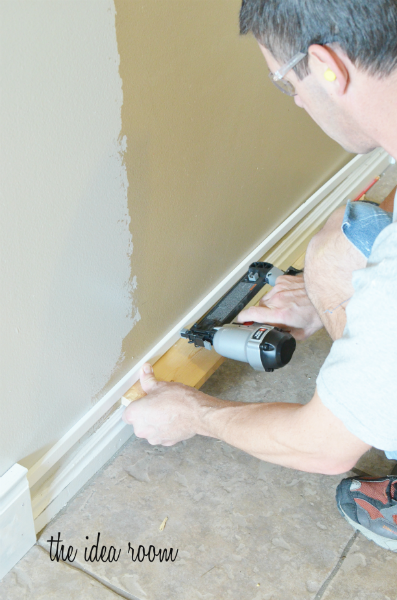 Just tape the wall and the floor with some Frog Tape or Blue Painter’s Tape to give you a nice crisp edge. And ta-da! An easy, (almost instant) DIY improvement. 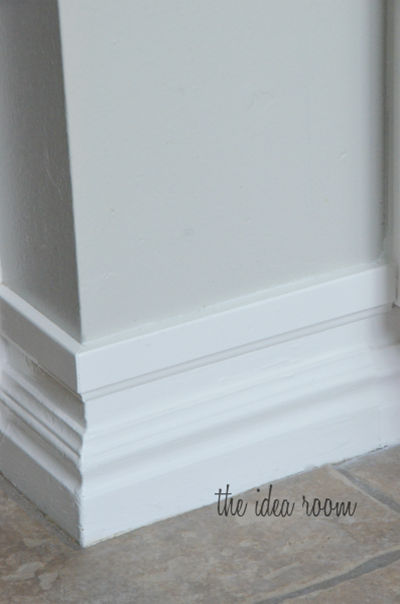 I just love the look of the taller baseboards. It really does make a big difference in the overall look of the room. *Update—I have had several of you email me and ask me what our paint colors are in this room. The wall color is Revere Pewter by Benjamin Moore. 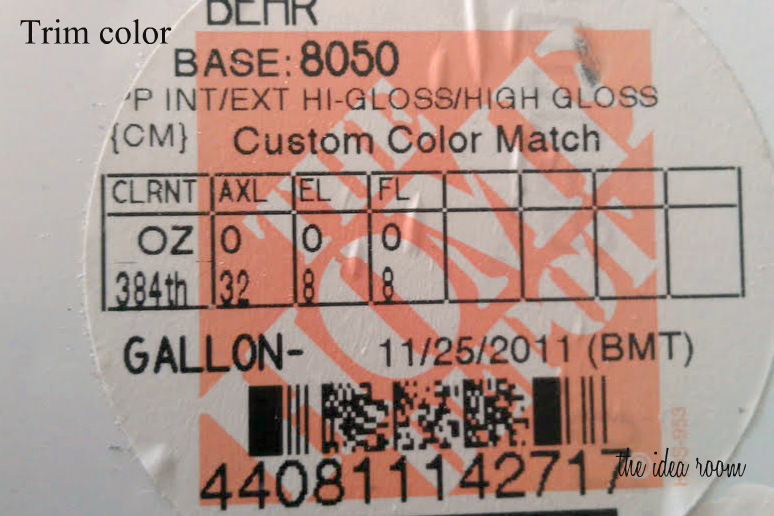 I do not have the paint name for our trim as we have been painting our trim this color for 8 years. 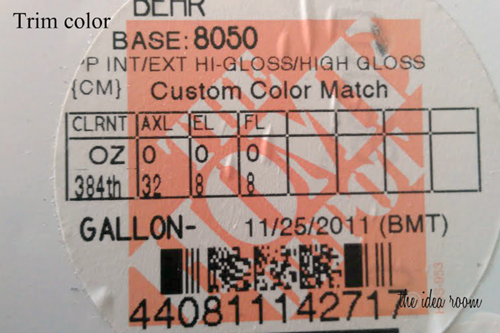 But I do have the paint code which is below. We use a high gloss finish on our trim as well. What do you think? Do you have any rooms you would like to give your baseboards a height lift? I love the look, too! 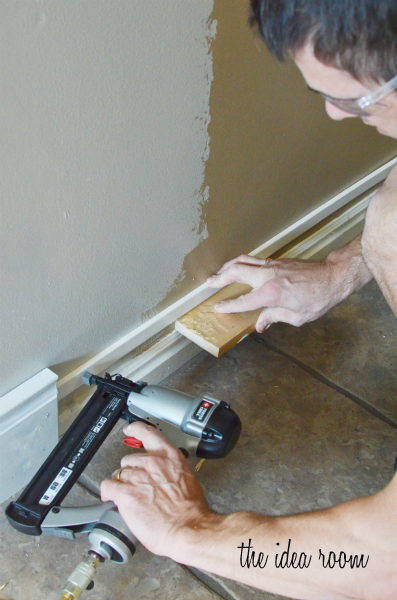 Quick question…I have VERY textured walls in my house so I am worried this method would not work with my baseboards…I am thinking you would notice the texture too much. Any suggestions? Great question! The texture on textured walls will definitely show through between the two moldings. You could add a thin layer of putty to cover the texture…which could be time consuming and a bit of a pain. Or you could try butting up two pieces of molding. Or perhaps adding a flat strip of molding in between the bottom and the top molding pieces. Then just fill all the cracks with caulk. But, depending on the cost of molding it may just be more cost effective to trade out the old baseboards with new and taller ones! What a great idea! Will have to include it on my list of jobs to do. Hello! You are a genius! Love this, Amy! Such a great way to get a more expensive look in a room. I am so jealous of your laundry room! It was such a blessing to meet you in person at SNAP! That you for everything you did to make it such a wonderful conference! 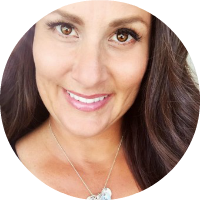 Traci–Thank you so much! I always feel that way about your home remodels :)! I loved meeting you and being able to get to know you a bit better. I only wish I would have had more time to hang out longer. You are so sweet and exactly how I pictured you would be! Would you be willing to share your trim paint color? I always thought trim was plain white, but we are in the middle of some remodeling & are being told no one uses white. Yours looks really nice. Simple and great looking, you have done a fantastic job! I have to say I am very jealous of your Laundry Room, I live in Spain, in European cities we don’t even dream of having a room exclusively for laundry, so yours is an absolute luxury I totally drool over. Congratulations on a great job!!! Oh! Thank you so much. We are very lucky. 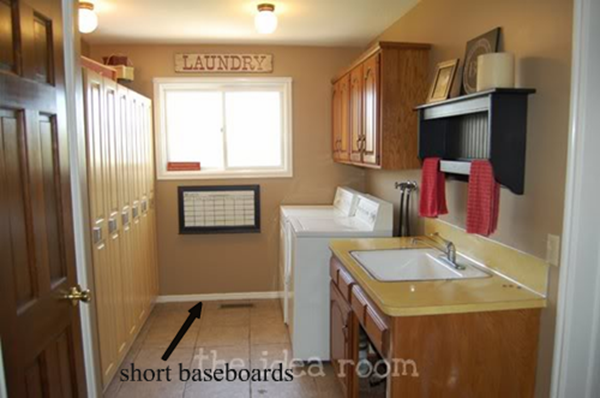 We do have a large laundry/mud room. It is where many family and friends enter our home (strange I know) so I wanted it to be nice! This reminds me of the post from The House of Smiths in 2009! Amy, this is such a great idea. 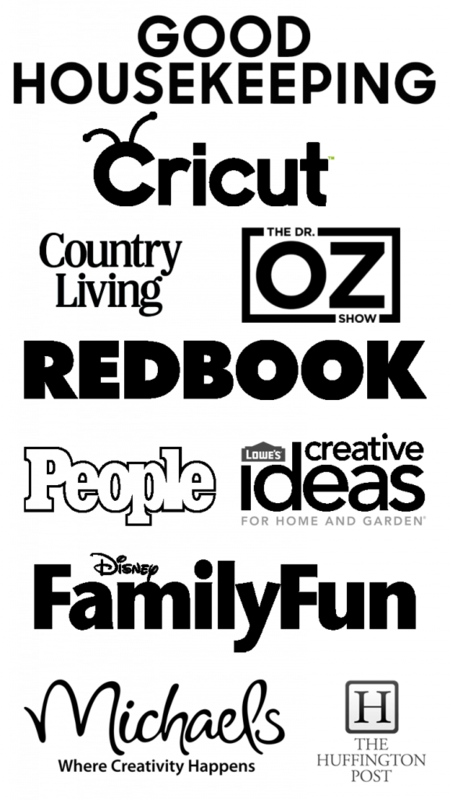 Our baseboards are so similar to your original ones. I am itching to do this now!! Love your high gloss white trim color, too. Does the high gloss make it easier to keep clean? We need to probably do an overhaul with all of our trim and I’m loving how yours looks. Love this! I love the look of older homes bc of the impressive homes but in today’s economy, can’t afford them. This is a brilliant trick to fool the eye! Thanks! Thanks Terri! I love the look of the taller molding too but it is so much work and $ to replace it all. This little trick can help! I am in love!!!!! I have one question…. Your base boards are the same as mine. When you got to the door frame, did you leave it the same or make it wider as well? If you did make it wider, how did you do that? I have been wanting to do this forever and this is the best tutorial I’ve seen….thank you! Is the wall color Quiet Moments or Revere Pewter? The wall color in the laundry room is Revere Pewter by Benjamin Moore. It is a pretty true gray color but can have some beige undertones in the right light. But in my house it looks a fairly neutral. Keep in mind though that paint color will look different depending on a lot of factors though. So even if you love it in one room, you might not in another due to lighting and windows, etc. I personally LOVE it and put it in my entry way too. I think it looks great with my dark brown floors and the white and even black accessories. Quiet Moments is the paint I have in my kitchen and my daughter’s room! LOVE it too. It is a blue gray. What kind of molding did you use? Where did you buy the molding? I keep looking at prices and they seem more expensive than the actual molding. I know I’m looking at the wrong places. (Home Depot, etc). Can you share where you bought the plain thinner trim? Thaaaaanks!!!!!! We actually bought our molding at Lowes. You can get moldings made out of different materials. Try looking at the pressed wood if the real wood options are too expensive. Hi Amy! 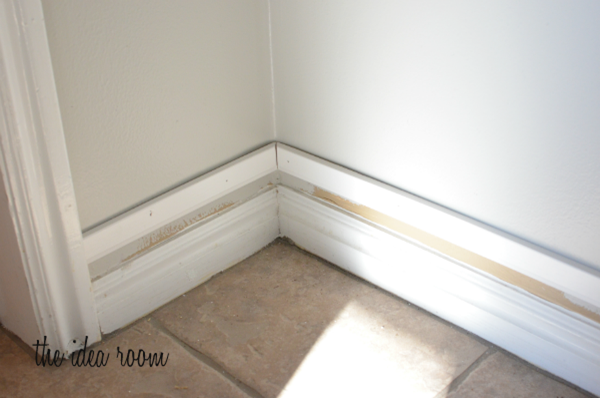 You did a stellar job on your baseboard trim…I’d love to do this project myself. I looked all over the moulding and trim department at Lowe’s to find the thin, flat moulding you used in your tutorial, but I can’t seem to find it. Do you happen to remember the name of the material or where in the store you found it? Thanks for the post! I have just the opposite problem. Our 1922 craftsman home has 6″ base in it, with a shoe nailed at the bottom to fill in between the floor and the bottom of the base. After sanding and refinishing the floors, the shoe in one room is now too short to bridge the gap. 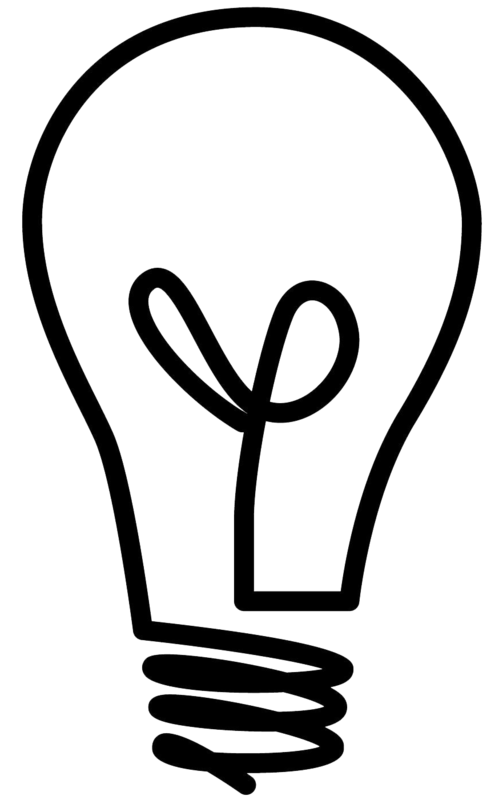 some where my wife saw a TV show where the same problem was fixed using an ell shaped piece of laminate or plastic. the new piece fit over the old base and was scribed and cut to extend the base down to the floor height. Envision putting a cap on the existing base and trimming the bottom as needed. Can you help point me in the right direction to find this stuff? It would be a how lot easier than milling new baseboards. I have a suggestion for Amy with the textured walls, Put the trim up just like in the tutorial but then in between the two moldings take a putty knife and wet the area and slide putty knife across to remove finish, sand a little bit and that should make the two match pretty well. What is the height of the molding piece you added? I would love to try this!! Thanks for the tutorial!! This is a very smart idea. Love it! I want to put new baseboards in the livingroom but maybe I will just do this in the other rooms! Hi! Pretty room!! Where did you find the awesome rug? Thanks for the fun tutorial! I actually have a non-baseboard question. I noticed that you also painted your sink cabinet and changed the top. Did you replace the top or refurbish it? If you refurbished it, what did you use? We did replace it with a faux granite laminate. I had thought of doing this in my bedroom and never did – thanks for the reminder of how great it looks. Love the laundry room. Love it. I have been looking at fixer-upper homes to purchase and calculating the cost of wood needed to install wide baseboards. This is an excellent idea to save money and give it a touch of modernness and that touch of style the homes would need. Thanks for sharing. Love it! This is brilliant! i was looking for an idea on how to “beef up” the chair rail molding on my wimpy wainscoting when i found this. So i’ll use your great idea for that AND to beef up my baseboards. Thanks so much. My trim is VERY old. Think 1970’s, 2 inch, plain wood trim. Do you think this could still work for me? The trim has no fancy edges or cutting. I’m just afraid that the short part closest to the floor would look so thin and pathetic below something a little bulkier. What was the original height versus the new height? Thanks! I’m more impressed with the wooden pedestals under the washer and dryer. I want to make some but not sure size of boards to use. Love this idea!! We are now doing this but at the corners the baseboard juts out!! How do we fix this? Susan- There is trim for corners that you can use. Just go to your local lumbers store and they should be able to help you with that. Thanks for this info. It will save me a lot of time and money. Just curious though, does the last picture, the enlarged one before the paint info., show more than one ‘layer’ added? Mark, Glad you found this post helpful. The picture is just the baseboard and one piece of trim. Hope this helps.